Beginning a couple of months ago, managed Facebook business pages began to see a noticeable fall-off in activity, or drop-off in organic reach per fan. Posts were reaching a much smaller number of fans than usual. Usually, around 16-20 percent of a total fan base was considered to be a large number in terms of organic reach. So if a page has 2,000 fans, possible reach for a post could have been anywhere between 320-400 fans seeing that post in their news feeds. However, since this number has dwindled down to 4-6 percent, the reach number is now between 80-120 fans being exposed to a post, and some are saying Facebook will take it even lower, to 1-2 percent (that’s just a reach of 20-40!). This change in Facebook’s algorithm was met with outrage, especially by small business page/group owners and Facebook’s suggested fix for this was to do paid ads to increase the visibility of a post. Business page owners spent a lot of time accumulating their followers and likes that they have, it became frustrating when it appeared that all this work they did was now secondary. Facebook says that this change is not because the company is trying to make businesses “pay to play,” it’s because there is so much more information being posted these days. Basically, competition for space in the average users news feeds is causing organic reach to drop. Rather than showing people all possible content, the news feed is designed to show each person on Facebook the content that’s most relevant to them. Of the 1,500+ stories a person might see whenever they log onto Facebook, news feed displays approximately 300. To choose which stories to show, news feed ranks each possible story (from more to less important) by looking at thousands of factors relative to each person. Understandably, Facebook won’t share what those thousands of factors are (it’s their “secret sauce”), but not surprisingly, they do suggest that if you buy ads, your reach will be better. No matter what the explanation, it appears that the free ride is nearly over for businesses that use Facebook as a marketing tool. Where once success was determined by likes and follows, now if you want a successful business page on Facebook, you must have great content, the interest to draw Facebook’s attention and the budget to supplement a reliable ad campaign. Now that the news feed’s content is far more limited, you will need more content to increase your chances of being posted for your followers to see. This means posting more often at all times of the day. Posting once or twice a day will only work if those posts receive a massive amount of activity. You will want three to four posts a day, at various times of day. How recent a post was made is a large factor for Facebook, so older posts have an increasingly low chance of being put up on the news feed. Having a relatively fresh post at all times of the day will help. And remember that posts with pictures are especially engaging. Posting frequently is best, but you also want to find out when your followers/fans are the most active. Under ‘posts,’ Facebook has an option for your managed business page called “Insights.” This option allows you to see the activity on your page, how large it was and when it occurred. 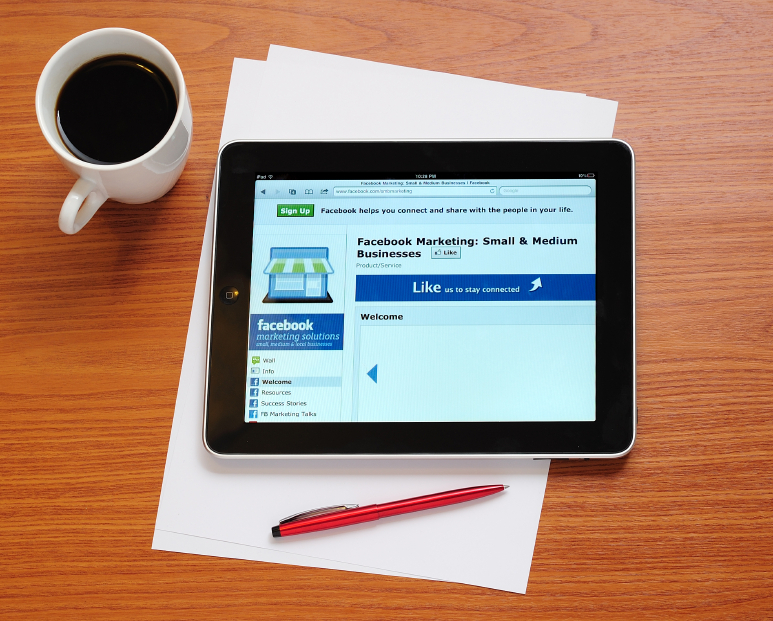 Use this information to help decide when to be active on your business page. Link back to your regular business website and any other social media accounts you may have. This is great for Facebook’s algorithm, but also for Google’s algorithm. The more connected your pages are, the more likely it will be noticed by search algorithms in general. To stay up to date with the latest changes in Facebook, bookmark the Facebook for Business News page. Remember, though Facebook pages are changing constantly, some important strategies remain the same, such as always providing valuable information to your audience. While the loss or gain of some features might make it more difficult for you to reach more people, focus on strengthening the relationships that you already have with your Facebook fans. And finally, as a general user of Facebook, if you want to improve the chances of seeing posts from pages you care about, you should consider clicking the “unlike” button on pages that you don’t really engage with. 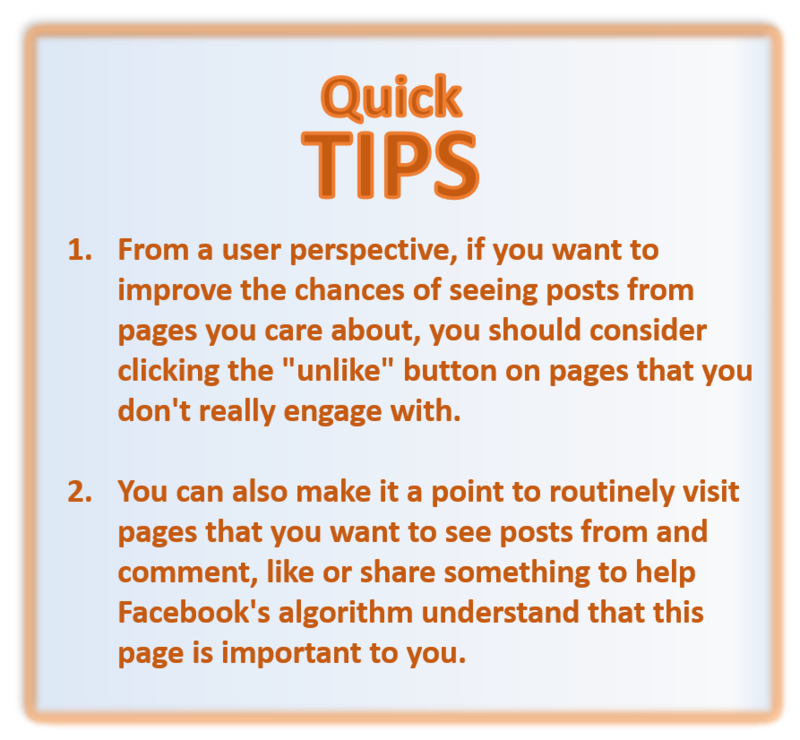 You can also make it a point to routinely visit pages that you want to see posts from and comment, like or share something to help Facebook’s algorithm understand that this page is important to you. Sources: Facebook; “Facebook is Killing the Managed Business Page” by Michael Bird, August 9, 2014; “The Free-Marketing Gravy Train Is Over on Facebook,” by Victor Luckerson, Time, March 22, 2014; “Facebook News Feed Changes Can Hurt Small Businesses,” by Ken Colburn, June 18, 2014.